HBO presents the new one-hour drama series from the fertile mind of Aaron Sorkin and executive produced by Sorkin, Scott Rudin and Alan Poul. Smart, topical, humorous and highly entertaining, The Newsroom takes a behind-the-scenes look at a high-rated cable-news program at the fictional ACN Network, focusing on the on- and off-camera lives of its acerbic anchor (Jeff Daniels), new executive producer (Emily Mortimer), their newsroom staff (John Gallagher, Jr., Alison Pill, Thomas Sadoski, Olivia Munn, Dev Patel and others) and their news-division boss (Sam Waterston). Overcoming a tumultuous first day together – climaxing in a newsflash that a BP oil rig has just exploded in the Gulf of Mexico – the team sets out on a patriotic if quixotic mission to “do the news well” in the face of corporate and commercial obstacles, and their own personal entanglements. Though he did well with earlier movies, Aaron Sorkin really made his name with the long-running TV series The West Wing, and he later snared an Oscar for his Social Network screenplay. 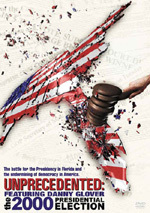 Sorkin’s initial attempt at a TV show to follow West Wing only lasted one season, however, as Studio 60 failed to gain an audience. 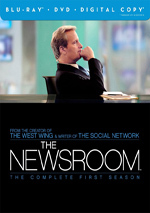 Sorkin comes back to TV with a more limited series, the HBO program The Newsroom. As expected, this concentrates on the people and events within a TV news studio. The Blu-ray set spreads all of Season One’s 10 episodes across four discs. The plot synopses come straight from the Blu-ray menus. Though Sorkin has been in the business for 20 years, I’ve had somewhat limited experience with his works. I’ve seen the six movies he wrote but had never watched any of his series. That leaves me only partially familiar with the “Sorkin Style”, though I gather he tends toward “written” and not especially naturalistic speech. If that preconception is correct, it manifests itself consistently throughout this episode. This style can be hit or miss; while Sorkin creates some dazzling wordplay, I can find it hard to get past my belief that no one actually speaks like that. If such “scripted” dialogue puts you off, I suspect Newsroom won’t be for you. I’m not sure how I’ll take it in the long run, but despite its lack of realism, there’s a sparkle and verve on display here that keeps me entertained. Even with all its lapses into artificiality, “Decided” launches the series in an entertaining manner. By the way, an actor who starred in a recent Sorkin-scripted film does an uncredited voice performance as an expert Will interviews on the phone. This is cute but acts as a distraction, I think. Hopefully the rest of the series won’t follow this Frasier route. While it doesn’t have quite the same zing as “Decided”, “2.0” keeps the series moving. It threatens to delve into soap opera, and I could live without the apparently inevitable Capra-style moralizing that could become a staple, but otherwise, the episode gives us a fun experience. In particular, a loony discussion of an Arizona law amuses. Newsroom comes set in 2010, which offers an unusual perspective, as it covers real news with real news clips but done by fake news people. Some times this feels like an attempt to refight the battles of that era, and it can become a method of editorializing. That means the newsroom scenes can be up and down. I enjoy them but I don’t know how realistic they feel, and the series seems intended to do little more than challenge actual news networks to step up their game and to tell certain political elements how dumb they are. I might agree with the series’ conclusions, but it can become heavy-handed. Because of this, the interpersonal moments can be more interesting than the newsroom elements, which is a reverse of what I’d expect. These segments can go into soap opera territory, but at least they give us a respite from the ham-fisted politicizing. I do find this to be entertaining – it’s too bright to fall flat – but I’m not enamored with all the lectures. Only Newsroom could take a New Year’s party and turn it into an excuse to lecture the audience about the evils of gossip. We get many more harangues about other political issues as well. The series has enough entertainment value in other ways to sustain it, but damn could we use a break from all the editorializing. This often threatens to become less a TV drama and more an op-ed piece. Cripes, I can’t stand guns but after this episode, I’m tempted to stock up on firearms just to spite the condescending writers. Am I the only one who thinks Newsroom would be more interesting if it didn’t focus solely on “big issues”? Granted, that’s an intriguing take on the standard “behind the scenes” series, but it feels somewhat gimmicky. At this point, I go into every episode wondering when the show’s lecture moment will come. It takes about half an hour this time, and it’s briefer than usual, but it does arrive – and more editorializing pops up later, of course. As usual, the program remains entertaining despite its slant, but I can’t help but think Newsroom would work better if it didn’t feel like it existed solely to stop Republicans during the 2012 election. Is it just me, or does Newsroom occasionally give off a less comedic 30 Rock feel? Mac often delivers a bit of a less goofy Liz Lemon feel, and Will can be like a less arrogant Jack. I doubt these parallels are intentional, but they come through to me. “Bullies” fares better than many of its predecessors because it feels less preachy. I like the segments with Sloan, as they bring out another side of a supporting character, and many of Will’s segments broaden horizons as well. If more of the series could be like “Bullies” – ie, expand characters and de-emphasize editorializing – I’d be much happier. With “5/1”, the series continues the positive trend seen in “Bullies”. Even with the major event involved, it avoids the standard editorializing and focuses on its characters. It meshes drama and comedy in a satisfying manner to become one of the season’s more complete programs. When I look at two-part episodes, I save my comments until the end of the second segment. That’s not going to change now. With News Night’s shift toward tabloid topics – and a mock debate - Newsroom comes back with some of its patented moralizing, but it delivers this in smaller doses than usual. That’s the best thing about the last few episodes: they’ve usually avoided the series’ weaker elements. “Blackout” still indulges in them a bit – and drags at times – but it gives us good momentum as we head toward S1’s finish. Season One wraps up a story line that spans 15 months – and comes full circle in some ways, though don’t expect it to tie up character elements with tidy bows. Actually, it acts almost as a cliffhanger in terms of various relationships, though it does conclude other narrative elements. Overall, it works fairly well as a season-ender, though it does restore the series’ earlier preachiness. “Fool” aired August 26, 2012, and acted as the show’s final attempt to influence the election; as such, it goes all out to air its grievances. The rest of it gives us more interesting material and a fairly satisfying finale; I just could’ve lived without the return of the op-ed bent. The Newsroom appears in an aspect ratio of approximately 1.78:1 on this Blu-Ray Disc. The series’ visuals usually looked quite good. The main exception came from the pilot episode. While the crew shot the other nine programs digitally, they made “We Just Decided To” on Super 16. That gave the program a consistently soft look, with heavier than usual grain and duller colors. After that, the visuals improved significantly. For episodes two through 10, the shows offered solid clarity; only a smidgen of softness materialized, so definition was usually positive. No issues with jagged edges or shimmering appeared, and I saw no edge haloes. Print flaws failed to mar the presentation. In terms of colors, Newsroom favored the modern palette of orange and – especially – teal. The bluish tint dominated the series; this wasn’t overwhelming, but expect a series with that look much of the time. Within those parameters, the colors seemed fine. Blacks were pretty deep and tight, while shadows mostly appeared positive; I saw a few slightly opaque shots, but those were in the minority. After a rough start, the series gave us pleasing visuals. The DTS-HD MA 5.1 soundtrack suited the shows pretty well but won't win any awards. The soundstage appeared nicely broad at the appropriate times and could be moderately engulfing on occasion. It's a talky little series, so the focus was mainly up front, but the audio expanded when necessary. This occurred mostly via gentle environmental ambience, so the surrounds didn’t have a lot to do. That said, the imaging made sense for the series. Sound quality seemed fine. Dialogue always appeared crisp and natural, and I had no trouble understanding it. The low-key music that acted as the score was warm and distinctive. Effects also seemed realistic and adequate for the tasks at hand. Newsroom won't be anyone's demo track, but the mix worked well for the series. 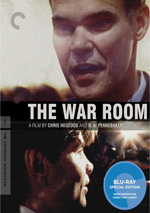 “We Just Decided To”: creator/executive producer Aaron Sorkin, executive producer Alan Poul and co-executive producer/director Greg Mottola. “The 112th Congress”: Sorkin and actors Jeff Daniels and Sam Waterston. 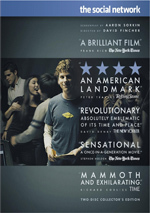 “I’ll Try to Fix You”: Sorkin, Poul and actor Emily Mortimer. “Bullies”: Daniels, Poul and actor Olivia Munn. “The Greater Fool”: Sorkin, Daniels, Waterston, Poul, and actors Alison Pill and Thomas Sadowski. Across these, we learn about story/character subjects and themes, cast and performances, camerawork and editing, sets and locations, and other aspects of the series. The various chats are generally informative, but I can’t say they sparkle in any way. We get a decent collection of notes and observations, but we always find a lot of happy talk and praise. Though I think the commentaries merit a listen, don’t expect tons of insights. By the way, even though “Fool” includes the most participants, it sags more than the others and becomes the least interesting. Fans will enjoy hints of Season Two elements, but the rest of it’s a dud. “Bullies” probably works best due to some interesting notes from Munn, though her grasp on the First Amendment seems tenuous. Next we find five Deleted Scenes. These accompany “We Just Decided To” (one scene, 1:24), “The 112th Congress” (one, 0:43), “Blackout Part 2” (one, 1:29), and “No Greater Fool” (two, 1:59). These give us some minor character moments and not much else; they’re good to see but lack much to make them memorable. We find Inside the Episode featurettes for all 10 episodes: “We Just Decided To” (3:10), “News Night 2.0” (2:42), “The 112th Congress” (4:05), “I’ll Try to Fix You” (3:27), “Amen” (2:02). “Bullies” (4:10)., “5/1” (4:32), “Blackout Part 1” (2:51), “Blackout Part 2” (3:31), and “No Greater Fool” (2:40). Across these, Sorkin discusses various character/story elements and other aspects of the shows. These act as sort of an expansion of the commentaries, and they throw in some good thoughts, though they do tend to act as recaps more than anything else. On Disc Four, two additional components appear. Mission Control runs five minutes, 17 seconds and provides notes from Mortimer, Pill, Waterston, Daniels, Poul, Sorkin, Mottola, video content supervisor Dave Henri, video effects supervisor Matthew Morrissey, production designer Richard Hoover, and art director Jeff Schoen. “Control” lets at the design and execution of the series’ main newsroom set. This goes past too quickly to deliver much meat, but it has some interesting insights. Finally, Roundtable goes for 25 minutes, 30 seconds and provides a chat among Sorkin, Daniels, Mortimer, Waterston, Mottola and Poul. They discuss aspects of the series’ story/characters, working real news into the show’s fiction, combining comedy and drama, cast and performances, camerawork and logistics, and a few other topics. If you’ve already listened to the commentaries, you’ll already know a lot of this content. “Roundtable” is a nice summary, but you won’t get much fresh info here. Two separate double-sided platters offer a DVD Copy of Newsroom. These lack any of the Blu-ray’s extras. Across Season One of The Newsroom, we get a lot of good drama and character development, but these come with a price: rampant editorializing. While I don’t think the series needs to be neutral, I’d like it more if it wasn’t so preachy at times. The Blu-ray gives us generally good picture and audio along with a decent set of supplements. Even with the preachiness, I still like The Newsroom and recommend it.